This is a generic professional ZIF version adapter. 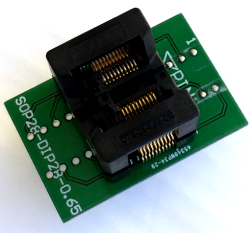 It converts TSSOP20 package chip into DIP20 package. It is 1:1 pin mapping from PLCC to DIP. All STC seriels TSSOP20 package MCU , such as STC12C0552, STC12C0552AD, STC12C1052, STC12C1052AD, STC12C2052, STC12C2052AD, STC12C3052, STC12C3052AD, STC12C4052, STC12C4052AD, STC12C5052, STC12C5052AD. STC12C2052AD STC12LE0552, STC12LE0552AD, STC12LE1052, STC12LE1052AD, STC12LE2052, STC12LE2052AD, STC12LE3052, STC12LE3052AD, STC12LE4052, STC12LE4052AD, STC12LE5052, STC12LE5052AD etc. All ATMEL seials TSSOP20 package MCU, such as AT90S1200 etc.